El Super Taco is the fourth consecutive Westside taco shop I have visited – I’m in a slump, as the Westside is not a hotbed of fine tacos, but rather a hotbed of taco eaters too lazy to travel far enough east to get good tacos. 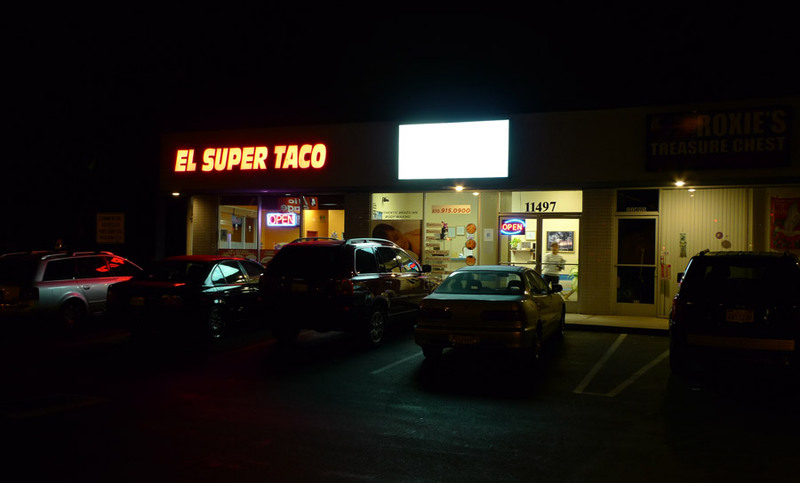 El Super Taco is a chain of approximately three Westside locations, and this one looked terribly banal on the outside, in a generic stucco strip mall next to the 405 freeway. I was pleasantly surprised, though, and likewise I hope you, my readers, will be pleasantly surprised when you scroll down and see the photo. 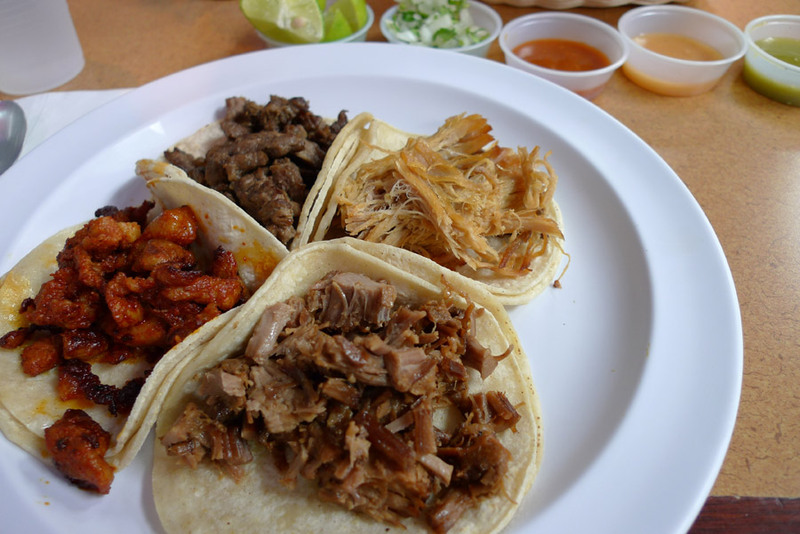 Four tacos, and all four meats vividly distinct in color and appearance! Although it’s in a crap little strip mall storefront illuminated by a half-dozen lay-in 2×4 lensed fluorescent fixtures in a blue-painted acoustic panel ceiling, the unexpectedly clean and tidy interior seemed warm and welcoming, as did the serveuse who took my order and offered me complimentary chips. I ordered one each of the carne asada, al pastor, carnitas, and suadero tacos, quite reasonable at $1.25 each. I settled in with my tray of chips and sampled three of the five salsas from the salsa bar, the ones labeled “salsa roja,” “salsa verde,” and “salsa suicide”. This latter salsa filled me with a desire to live! It is a very hot habanero-grapefruit, my new favorite flavor combination that brings me back to Campos’ Burritos on Venice at Motor every week. The rojo was okay, tasting a bit like Tapatio mixed with essence of pencil graphite; and the verde was pretty spicy too, with a flavor that I spent much of the meal attempting to identify, a frequent problem of mine. In the end I decided that it tasted like one of the unidentified, weird “spice” jelly bean flavors. The chips, oily and recently fried, were reminiscent of fried wonton strips – I don’t know why or how. I ate the suadero first – compelled to order this rare option. The meat was quite good, juicy and tender but with a bit of tooth resistance at first bite. Leanly seasoned, it had a strong gamy, beefy flavor. I don’t know how they prepare it, but the texture and taste reminded me of braised short ribs. The tortillas were hot, and seemed to be steamed rather than griddled – doubled, but not laminated, they performed correctly. So many tacos suffer from watery meats that saturate and destroy their tortillas and drip dirty meaty squirts out their backsides, but these meat fillings were appropriately dry in character. I ate the carnitas next, dressed with the salsa verde. It was a particularly dry, stringy, fried and textural carnitas with a nice golden brown hue. It seems dry at first but when you compress a mouthful of it a porky liquid magic seems to lurk in its core. The carne asada was fine, elegant and proper, although fairly inconspicuous after I applied a distracting mixture of Salsa Roja and Salsa Suicide. The al pastor looks a bit like orange chicken from a Chinese Food and Donuts shop, but was dry-rubby in character, with cinnamon and clove notes. Griddled to a gracious orange-and-black color scheme, it had a good texture, although in the middle of this taco I encountered one of those unfortunate chunks of cartilaginous flesh that you can barely chew through. I tend to enjoy the dry-rubby stuff, although this was really no better than the cheap preparada al pastor you can get at the Bodega R-Ranch Market #14 supermarket for home grilling.